The History Press is back on top form, recently rolling out three new books on the supernatural – Haunted Dundee and Paranormal Cumbria (both authored by Geoff Holder), and Haunted Southend (Dee Gordon). As always, the History Press production values are high, with good quality print and each of the books containing dozens of photographs and illustrations. One of my old college lecturers once joked that if he had his way, the grade of any publication would be based on the size of the bibliography. Using this method alone would guarantee Haunted Dundee came top of the class, and fortunately Geoff Holder’s writing style ensures he deserves to be there. Holder approaches the subject matter with just the right degree of reporting and cynicism, his research pouring scorn on some of the more traditional tales of ghostly activity in the city (I’ll even overlook his criticism of ‘database dependent paranormal websites’!). It is a refreshing change to find a ‘haunted’ book that is not afraid to tear apart myths and draw a distinctive line between folklore and those ghostly encounters which are well documented. Similarly, like any good paranormal investigator should, Holder looks for the rational in many of his stories, citing psychological, neurological and environmental factors as explanations to haunted beliefs. 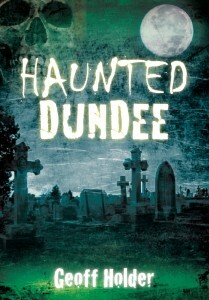 With an abundance of strange and unexplained stories, Haunted Dundee achieves what its author intended – Dundee is indeed back on the paranormal map.